Danforth Diamond is committed to being the absolute best and most comprehensive source for Diamond engagement rings on the Web. We provide expert advice and guidance so that you will enjoy shopping for engagement rings with utmost confidence and satisfaction. Our commitment goes beyond simply offering the best values on the best diamonds and ring settings; it also includes providing the entire resource guide necessary for choosing perfect engagement rings. You can rely on over 50 years of jewelry expertise to ensure that you receive the highest quality jewelry for the best value. We value our customers and are committed to offering the best jewelry buying experience of your lifetime. Education: We don't want to just sell you a diamond. We want to guide you to the perfect diamond for your special someone. That begins with education. We encourage you to browse our Online Engagement Rings Learning Center before you buy. You will also find valuable information on which ring setting is right for you and which precious metal is best suited to hold your diamond. Go to the Learning Center now. Value: Our goal is to provide the best value in diamonds and engagement rings anywhere. This doesn't mean offering lower-quality products or stones. Rather, it means offering a full range of high-quality diamonds at better prices than you've come to expect and premium engagement ring settings custom made in the USA. Selection: Every diamond engagement ring is as unique as the person who will wear it. We offer an incredible selection of online engagement rings that allow you to tailor your diamond purchase to precisely fit your loved one's style and taste. We offer the largest selection of ring settings in a wide range of precious metal choices so that you can buy from us feeling confident that you have purchased the perfect high quality ring to suit your personal preference. Premium Shipping: Most orders are custom made in the USA and shipped within 7 business days of your purchase. Most of our orders are shipped via FedEx next day delivery and must be signed for to ensure that they make it to you safely and quickly. We believe you shouldn't have to wait long to give the gift of a lifetime. Return Policy: Though we fully certify every one of our stones, we also promise to allow you to return any purchase with which you are not completely happy. Our 30-day Return Policy is our commitment to your satisfaction. Accessibility: Our experts are available Mondays through Fridays, 9:30AM-5:30PM via phone and e-mail to provide guidance and answer any questions you may have about your diamond--before and after you've purchased it. Jill Renee has always had a fascination for fine jewelry! She is steeped in jewelry expertise, and even married into the fourth generation of a family with deep roots in the jewelry industry. Now Jill Renee offers her expertise to you. As President, Jill Renee treats our customer as she prefers to be treated. Danforth Diamond manufactures a huge array of solitaires and engagement jewelry in a wide assortment of fine metals – Gold, Platinum, Sterling Silver, and Palladium. In fact, Danforth can provide any setting you desire in the metal of your choice. 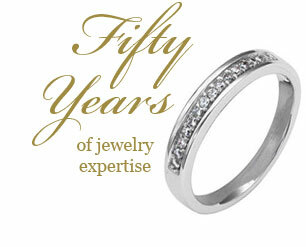 Danforth Diamond also offers specialty jewelry items such as high quality enamel and silver keychains direct from Italy. More importantly, we source our diamonds directly – India, Antwerp, Israel, to offer our diamonds at wholesale prices. Providing an excellent product at a fair price is what every customer deserves. Our online shop operates by providing the same attention to customer needs that has guided our family business for over 50 years. Why Buy From Danforth Diamond? Danforth Diamond specializes in engagement jewelry, so you don't have to. We know choosing the right diamond engagement ring is a difficult and complicated task. Is the diamond a good quality? Is the precious metal the right color and karat? Is the ring expertly made to last and hold the diamond? Is the price fair? Add an intimidating salesperson to this and it makes some people postpone the engagement! Yes, picking the perfect engagement ring can be overwhelming and that’s why we have eliminated low quality diamonds from our web based jewelry store. Our inventory is limited because we have selected each and every diamond as if we were choosing it for ourselves. We do not offer diamonds of inferior color, cut or clarities. We filter out diamonds with thin girdles that can easily chip and diamonds with high fluorescence that look cloudy. Our diamond prices vary so you are sure to find the very best diamond possible based on your budget. The perfect engagement ring is more than just the diamond. The engagement ring must be made from high quality precious metal. We have set strict rules for our engagement rings and the metal that they are crafted from. Our engagement rings cannot be thinner than 1.5 mm so that you don’t have to worry about wear over the years. In fact, our rings are 20% heavier than average because of our high standards. If you buy your engagement ring from us, you can be sure its the finest quality available. Your engagement ring and wedding band will last throughout your lifetime and generations beyond. One of our goals is to offer as many matched sets as possible, because we have heard over and over about women receiving their engagement ring and not being able to find a suitable wedding band, or even worse getting a band that cuts or wears down the engagement ring. We don’t want you to worry about one of the most important purchases of your life! Many People think that 40% off retail means that you get something less in quality. They are wrong! Because we are fanatics about engagement rings, we demand high quality and we will never compromise. Our reputation is based on our product and your complete satisfaction is our goal. We back this up with our 30 day, no questions asked return policy. You pay 40% less because we don’t have to pay store leases and sales associates. In fact for every $1 million in jewelry store sales, they need four sales associates. For us, it is only ¼ person. This means big savings without sacrificing quality. Our website is hacker safe and your credit information is secure. Rest assured you can purchase your online jewelry and your personal information will remain confidential. Best yet we offer great personal service. If stuck with a question, Jill will answer any questions online at experts@danforthdiamond.com or you can personally talk to one of our sales representatives at 1-877-404-RING. Let’s face it, we all need help and reassurance when making a big purchase that will mean so much to those we love. E-mail Jill for personal attention or call to speak to some of the nicest jewelry experts, hopeless romantics and pure jewelry lovers in the industry!